Soon, many of you will begin researching and making plans for evolving our offensive system. While the process is usually fun, the following ideas can help focus your efforts and make the time spent productive. Evolving your system should begin with a general inventory of what you are doing right now along with the stats on each concept, formation, procedure and personnel group from the 2013 season. Below is a list of questions to consider. What is our offensive philosophy? What is our philosophy in each of these categories: Procedures, Personnel, Formations, Running Game, Passing Game? List all of the terminology that is used throughout the structure of offense. How many words are used in each of the categories: Procedures, Personnel, Formations, Running Game, Passing Game? Are there opportunities for confusion in our structure? For example, do we label a pass play in with an NFL team name, but also use an NFL team name for a formation? Did we create a structure that is clear and concise with its use of words or numbers? What procedures exist in our offense now? Are there advantages we are not thinking about in varying our tempo or having the ability to use cadence as a weapon? If we were to utilize no-huddle, how will we communicate and is our system set up for communication in a no-huddle procedure? Are we fully utilizing the personnel we have? What skills does each of our players have that we can build around? Do we have a system of substituting personnel packages into a game? Is it flexible enough to have the answers we need from year to year? Is it simple enough for the players and coaches to use? How many words make up our formation system? Are there terms that cause confusion? Can we align quickly and without error? Is our system flexible and multiple enough to move our offense along the spectrum of a compressed multiple back offense to spread shotgun if we choose to move in either direction? Do we number our plays or name our plays? What is the specific structure we use to communicate who is carrying the ball, direction of the run, and blocking scheme? How many plays or schemes do we utilize? Can we combine or delete different plays to become more efficient? How many practice reps are available to practice all of these plays? Do we use numbers or names or both for our passing plays? If we use both, is there a consistent reason for using both numbers and words? Do we memorize a play or utilize concepts in which we teach a rule based on alignment? Which is best for our system? Are passes tied directly to formation, or do we have ways to call the pass from multiple formations or personnel groupings? How many plays or routes do we utilize? Can we combine or delete different plays to become more efficient? Next, you will want to list some of the ideas you had or concepts you are interested in, and find your resources. Those resources can come from a variety of places like visiting other college or high school teams, coaches clinics(though you may not get the depth you need from a clinic), dvd’s, books, and online resources. For over 700 links to offense resources click here. Does it fit our philosophy? Does it fit our kids? Can we coach it and fix the problems? Does it help us beat the key teams on our schedule? That is a sound thought process when considering additions and selections to your offense. Learning football is always fun, but the great ideas you uncover in the off season must translate to success on the field. If you can answer “yes” to all of those questions, then maybe it should become part of your offense. Remember though, when something goes in, usually it means something should be cut in order to remain efficient in how the entire system is practiced. For most of us, the problem is knowing exactly when we will get that look. Granted, with film study and tendency breakdowns, we may be able to key in on some times when we will have that look against us. One way to accomplish this is to put it in the quarterback and receivers hands. Any time free access to quick game exists, the QB should check his protection, preferably getting the offensive tackle on the quick game side setting the defensive end immediately so his hands are down. The receiver or quarterback can hand signal the route, and from there it would be simple pitch and catch and hopefully some RAC. We are adamant about teaching our receivers to catch the ball and “run through the noise” rather than standing there and trying to juke after the catch. We tell him if he is in wide open space he can make a move, other wise get momentum going and get tackled going forward. We basically begin with either a hitch or a quick out. If there is any worry about a tucked linebacker flying out or if the corner is inside leveraged we can check to the quick out. We want our quarterback to understand the situations where he can do this. In general we tell him 1st or 2nd down unless we have a special or shot called, or on 3rd and 6 or less. We’ve extended that at times up to seven yards. Not comfortable putting that decision in the hands of your quarterback & receivers? No problem. Whether you are a no huddle or a huddle team, you can have a simple hand signal or procedure where your quarterback looks to you to see if you want the quick game thrown. What does everyone else do? 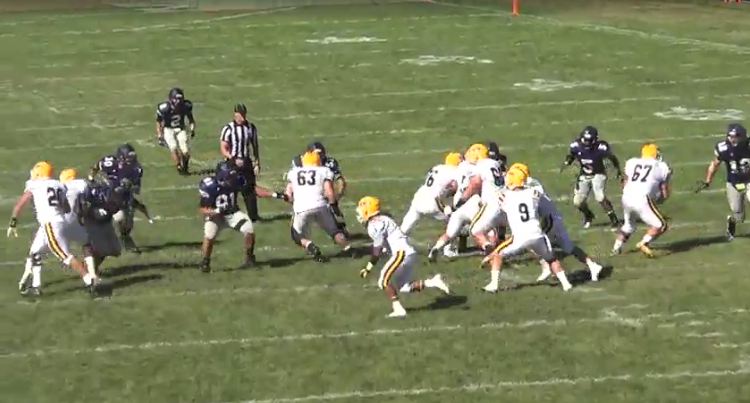 Hopefully, they see the pass completed and turn and block downfield. There are several things that can be tied in with the boundary quick game. One concept we like is the Quick/Naked concept, so that if something happens post snap, the quarterback isn’t standing there holding the ball or forcing a throw away. Other options include building in 5 step concepts coming from the other side that allow for different timing. These would have to be relatively shorter routes because of the nature of the protection, but something with a longer timing than quick game will allow for the quarterback to have other options. Read “Evolution of the Quick Passing Game” for more ideas on pairing quick game with other components. Also, read more about the quick game in my resources post. To learn more about our offense please check out my iBook 101+ Pro Style Pistol Offense Plays available on the iPad and Mac. Growing up in Ohio, the Ohio State-Michigan game is always a big event. I’ve only been to one of these games, but I picked a great one – the first “Game of the Century” when Ohio State was ranked #1 and Michigan was ranked #2 in 2006. It was the best live sporting event that I have ever attended. I don’t consider myself a big football “fan.” I prefer to watch football on my own so I can rewind and watch a play multiple times without anyone complaining. However, that day, the atmosphere was incredible and it was exciting to be a Buckeye fan. I have been studying Ohio State’s offense over the past year, and I’ve accumulated some resources on the Buckeyes’ offense. These links explain the philosophy and strategy behind the OSU offense. Enjoy! OSU Base Run Game: The Buckeyes are a multiple inside zone/gap scheme offense. They blend traditional turn-and-hand-it-off with the read game using the same zone and gap schemes. Urban Meyer Spread Offense Philosophy: Includes some historical background on the spread offense, general spread offense philosophy, and Urban Meyer’s spread philosophy. OSU Offensive Theory Pt. 1: This post discusses how the Bucks use numbers, match-ups, and conflicting the defensive end. OSU Offensive Theory Part 2: More discussion on Buck’s O theory – spreading the field, attacking the alley with screens, play action. Creating DE Conflict: Coach Hoover shares how the Gators under Urban Meyer conflicted the defensive end to gain an advantage. How Meyer Installs Offense: This article takes a look at how Meyer installs an offense based on his Days at Utah and BGSU. The post has some great links to Chris Brown(Smart Football) materials. BASH: The backside sweep tag that Meyer has used in his offenses. Gun Zone Read Option: Chris Brown provides a detailed analysis and breakdown of the gun zone option including video and diagrams from Meyer’s Utah days. Tom Hermann on stressing the defense: Includes interview quotes from Hermann and an explanation of flash screens and bubble with inside zone. Urban Meyer spread background: Urban discusses his offensive background and philosophy. Article has video and illustration of zone and counter plays. OSU spread arithmetic: Discussion of using numbers and spreading to run. Ohio State tempo: Discussion of tempo. Tom Hermann stated that the Buckeyes would use tempo to stress and control the defense. 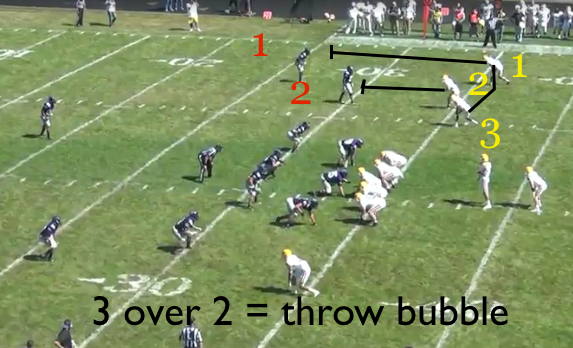 This article provides an explanation and plenty of links on no huddle and tempo. As does part 2. Plenty of links on Smart Football: Chris Brown’s information on Urban Meyer’s offense. Youtube Play list of UF plays: Plays from Urban’s Gator days. I’ve written several posts on Urban Meyer’s coaching method as well. Learn more about “on edge coaching” here. I also spotted some things that football coaches can learn from TBDBITL and how they learn with technology. 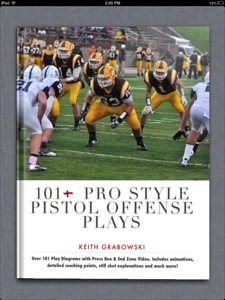 Please check out my iBook 101+ Pro Style Pistol Offense Plays available on the iPad and Mac. As a young quarterback playing pee wee football, one of the first pass plays I learned was the tight end “pop” pass. It was a quick hitting play- action pass off of a dive play. 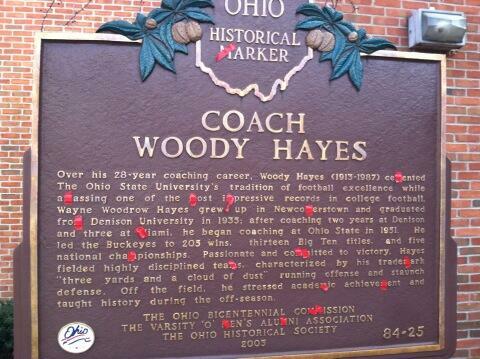 From what I can remember we ran it from the straight-T formation made famous in Ohio by Woody Hayes. After faking to the fullback, the quarterback stops and fires the ball to the tight end who simply releases from the line of scrimmage and looks for the ball just after he cleared the linebackers who are filling downhill on the dive play to the fullback. It was a very short pass, yet the yardage it gained on the seam created in the defense allowed for big plays. In August, I wrote an article on American Football Monthly on the power read play. It’s a play that we started implementing in 2012, but we needed to learn more about it. 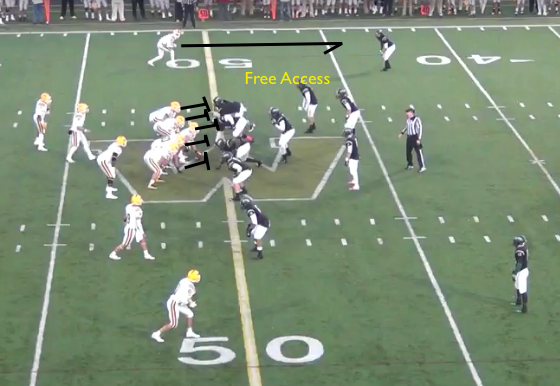 In the article I share what we knew in August about the Quarterback and Sweeper Mesh. Read more here. The power read play was very effective in every game in 2013. We ran it 62 times for 429 yards (6.9 yd. avg.). It was 60% efficient (runs of 4 yards or better) and we had 16 runs of 10 yards or more. Smart Football – What is the Inverted Veer/Dash Read Play? : The article provides the typical detailed explanation from Chris Brown on the inverted veer play. The Urban Meyer Ohio State Offense: Stretching the Defense: A very detailed explanation of Ohio State’s Inverted Veer and complimentary plays tracing back to his days at Florida. Nebraska defeating Michigan’s Inverted Veer play: Gives an explanation of why Michigan’s inverted veer play did not work against Nebraska. University of Michigan Inverted Veer: Counter point to the above article. Here is a good explanation of what the inverted veer is and how the blocking scheme functions. 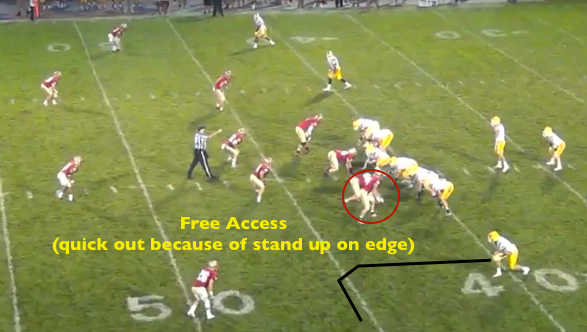 Also, the use of a fullback to help defeat gap exchange is illustrated and explained. Inverted Veer-Comboing Two of the Best Plays into One: Article diagrams the inverted veer against several fronts and has youtube video links. Youtube Playlist of Power Read Plays: The playlist includes 8 videos with 22 minutes of video clips including Ohio State, Auburn, New Mexico State, La Tech, and Nebraska. Power O, Inverted Veer, and the FB Adjustment to Scrape Exchange: This appears to be the same info as the Michigan post. Inside the Clemson Offense: Inverted Veer/Dash: Article on Clemson’s use of the inverted veer. Includes diagrams and explanation of video clips of several other college team running the play. Spread Offense- inverted veer/frontside read play: Includes a brief explanation and video of Ohio State. University of Nebraska: Inside the Playbook: Multiple Ways to Option the Playside DE: The article includes explanations of the traditional veer and the inverted veer. 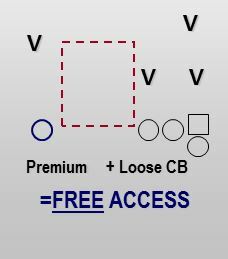 Diagrams of variations like Inverted Veer Triple Option and Inverted Veer Bubble are included. All 22: A Look at the 49er’s Inverted Veer Scheme: The article provides a still shot explanation of the 49er’s play. Will We See the Inverted Veer in the NFL? : The article provides a brief look and some video clips of the inverted veer play. Mississippi State use of Inverted Veer against Northwestern: Provides a still shot explanation of the play in the 2013 Gator Bowl. Insider’s Guide to the Zone Read Play: This article explains the inside zone read, midline zone read and inverted veer (power read plays). Diagrams and video of each type of read are provided. Stopping the Ole Miss Inverted Veer: A short explanation of how the Alabama gap exchange stopped Ole Miss. There are some things Ole Miss could have done better in their execution to defeat a gap exchange. A link to the video clip of the gap exchange is included. INVERTED VEER, CAROLINA PANTHERS-STYLE, PROVE THE READ OPTION ISN’T DEAD: An explantion of Carolina’s inverted veer with video clips, still shots, and a great overhead view. University of Michigan Inverted Veer Blocking: Commentary and opinion on what the writer believes are problems with the blocking scheme. Still shot illustrations and video clips are provided. From the Far Hash: A Preseason Primer on the Veer and Inverted Veer: Diagrams and explanations of the basics of the inverted veer. My interactive iBook, the first of its kind for football coaches, provides a detailed look at a pro-style downhill run game from the Pistol backfield set. Look for another iBook to be release in late December or early January on the read game from the Pistol. Get my first iBook here. Our defensive coordinator, Jim Meyer shared a video in our staff meeting today of the Ohio State Marching Band performing their half time show. He was fired up because of what a team of human beings accomplished together. The precision of the band was truly amazing and I’ve never seen anything like it before. I agreed that the performance was inspiring. I immediately wondered how they could do something like that and prepare a new show equally as amazing each week. This led me to do a little research, and I found that TBDBITL is leveraging technology in order to learn new music and perform a new show each week. The primary technology used is the iPad. The following article link and video explain how the iPad is used to help produce a new show in just ten hours of practice. For about the last year I’ve been writing articles on the possible benefits of the iPad and technology in coaching football. We’ve incorporated some of this in the current season, but I feel we are only scratching the surface. The OSU band is a prime example in how technology can help put together a precision human performance. What we do to teach our players precise plays and defenses can certainly be aided by technology as well. Of course, it does become more difficult when there is someone trying to take your head off while you are trying to be precise. None the less, technology certainly provides an advantage in coaching.